A newspaper in Australia is catching A LOT of heat over a cartoon that was trying to spoof Serena Williams‘ incident at the U.S. Open — because it’s racist as hell. 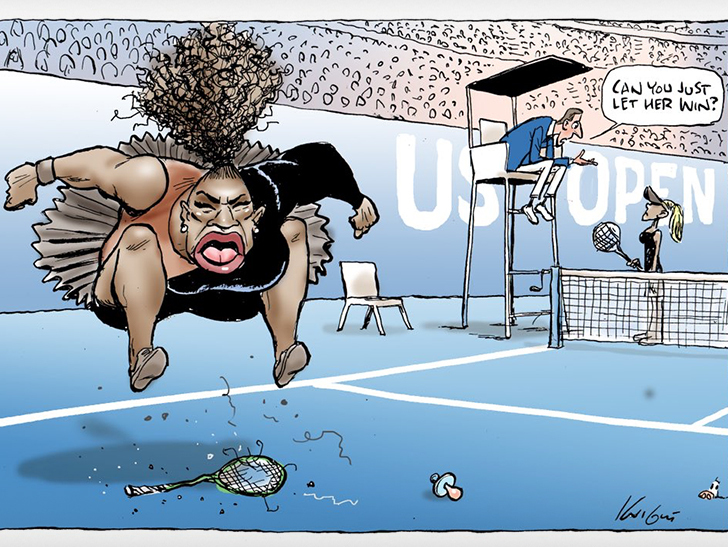 The cartoon — drawn by Mark Knight (editorial cartoonist for the Herald Sun newspaper) — shows the tennis superstar stomping on her racket. But, let’s get serious, it looks like a Jim Crow-era, Sambo-style caricature of a black person — not Serena Williams. So far, it doesn’t seem like the Herald Sun is backing down — they retweeted the image and haven’t pulled it. As we reported … Serena was penalized several times during Saturday’s U.S. Open finals match against Naomi Osaka. Serena went off on the judge claiming he was a “thief” who stole a point from her. The judge then penalized Serena a game for the “verbal abuse.” Williams continued to go off on the guy to other tournament officials claiming the judge would never treat a man that way.